Eyekepper BB60 lenses - Transparent lenses with 12 layer yellowish coating. 100% UV protection. Test via the spectrometer(the performance of blue light blocking): block 35% within 500nm, block 42% within 490nm, block 49% within 480nm, block 55% within 470nm, block 60% within 460nm, block 64% within 450nm, block 67% within 440nm, block 77% within 430nm, block 97% within 420nm, block more than 99% within 400nm-410nm. 20% color distortion due to 30% blue color was filtered out. 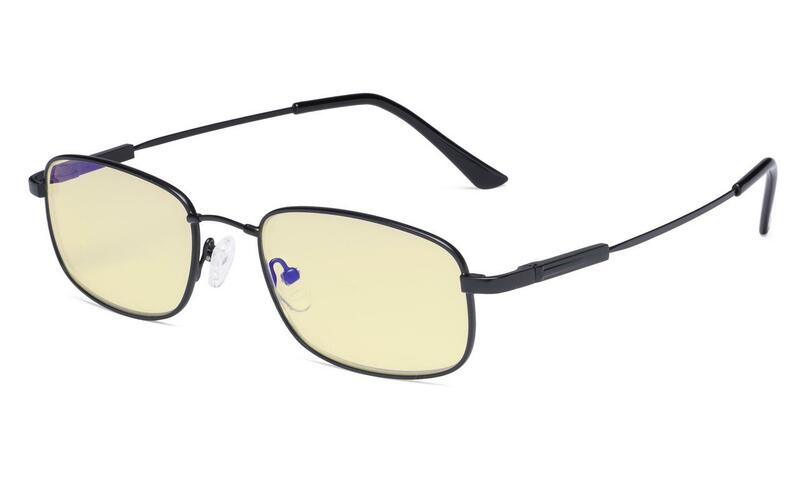 The lenses block 30% blue color of online test for color filtering properties. Please check Eyekepper BB90 and BB98 lenses if you need block more blue color and blue light. PRODUCTS DIMENSION-Frame Material is Titanium and metal, Lens width about 2 1/16 inches (52mm), Frame width about 5 5/16 inches (135mm), Lens height about 1 5/16 inches (33mm), Frame height about 1 3/8 inches (35mm), Bridge (DBL) about 11/16 inches (18mm), Temple length about 5 5/16 inches (135mm), with Spring hinge. In order to block much more blue, we upgraded the coating to more than 12 layers. Get maximum protection with ourpatented, multi layer coating designed specifically to reduce glare, reflect blue light away from the user and relieve long term eye strain caused by excess electronic device use. To avoid damage, never clean your computer glasses with paper towels or clothing or alcohol, and also avoid using household detergents or soaps. While a few mild soaps don't harm lenses, today's extra strength soaps are powerful enough to slowly disintegrate lens coatings. Copyright © 2019 EYEKEPPER.COM. All Rights Reserved.